Some of you really need to learn to read what is written before yelling out the first thing that pops into your mind. This was a commission piece done for Paul Whitner, who's the head of an agency that basically reps all the voice over people from movies, TV, commericals and etc. He wanted it to basically be him in the middle of all these Burton characters, so much ref was used. Apparently he liked Johnny Depp's characters the most, so theres (technically) three of them in it. One of the first client's to never complain about a thing..so I was really happy about that. He through a huge party over in Hollywood in the middle of October, and had me to do the poster for it. Which was printed like 5 times on huge wall mounts, invitations and then as mini posters. Was amazing to see people taking photos in front of it. And, some cool news. Tim Burton saw it from one of the attendees who's working with on him on Alice. Really enjoyed it apparently said he'd love to come to the party...I don't know if he came, but hearing he really liked it was enough of a compliment. PS: Thats Paul dressed as Sweeney, and the other partner of the company, Jay, is lying beheaded on the ground. AWW I love the story as much as the picture! so cool! Dude. Even though this is still September, I have to say it: This Is Hallowe'en. I've loved Nightmare Before Christmas and Edward Scissorhands and Mars Attacks! since the first time I've seen each; going back far enough (as in the case of Edward Scissorhands) it still seems odd to me that at that point in my life (early 1990s) it's still one of my more vivid visual memories, or more accurately collection of visual memories from different points in the film. There are very few things, much less modern entertainment or movies, that have survived in my memory to that degree. Thoroughly excellent picture, ami. 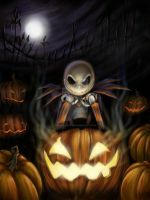 Everyone Hail The Pumpkin King! Amazing work, but Tim Burton didn't directed The Nightmare Before Christmas. No, he produced it though. So awesome. That's one party I'd have love to have gone to. you drew the picture of my dreams! I love Tim Burton! Well done all a Burton best films. But why dose Sweeney have facial hair. He looks like Orlando Bloom. neat! but where's Vincent and frankenwinnie? Pretty much all the great Tim Burton works wrapped up in one... bravo! what a perfect homage to tim burrtons work! Burton is an epic WIN! I love the way you set this all up! Totally awesome! I love Tim Burton's films. Why does Sweeney Todd have a moustache? Tim Burton, really? that isn't too shabby at all. This is really cool! Your whole gallery is amazing! Hihi brilliant... I love Jack...!! Oh my god! I am in love!! You are brilliant! But why should I worry?